from 20 €/night incl. 2 pers. Welcome to our small scale, family run, farm like camping and glamping paradise. All the way up in the Serra da Cabreira mountains – guaranteeing an amazing 360 degree view. 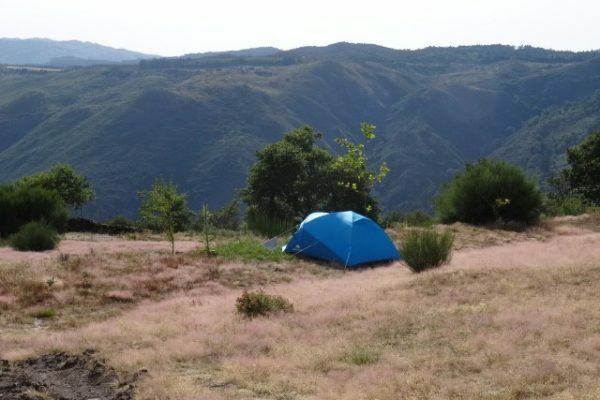 Spending your holiday at nature camping Quinta Rural in North Portugal brings you to the core of Portuguese mountain life and traditions: agriculture, history and wild nature waiting to be discovered by you. As soon as you leave the below wine valley behind you, you get a different ´feel’. 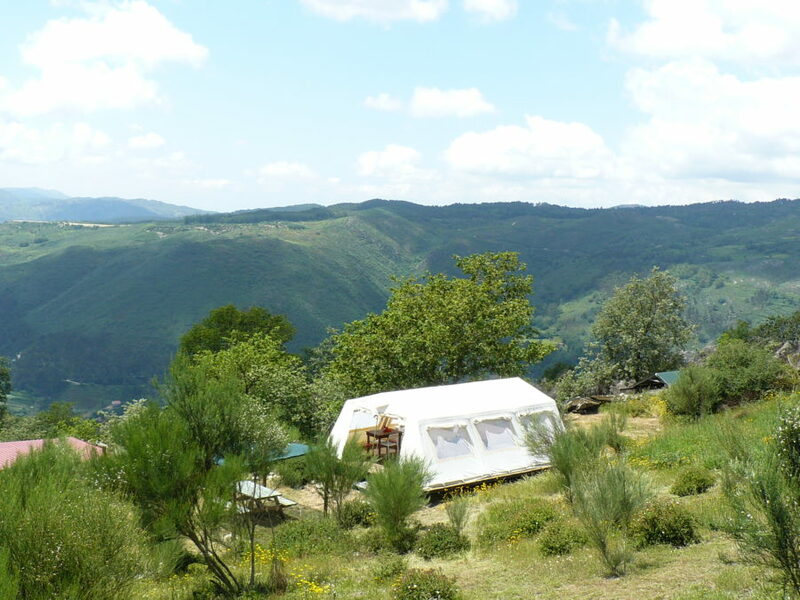 At Quinta Rural, you will find 5 spacious camping pitches, 6 furnished tents, 1 straw bale cabin and 3 mountain lodges. Although we are small scale in numbers, we aren´t small in area, nor in facilities or service. Check out our facilities here. Being passionate about our life up here in the mountains, we love to share our best experiences with you. Being just a couple with a toddler and some help of friends, volunteers and season jobbers, our activities and bar offer can differ, depending on the season and the amount of ´helping hands. But no worries; our self written ´guest guide´ has all the good spots, trails and outdoor activities. 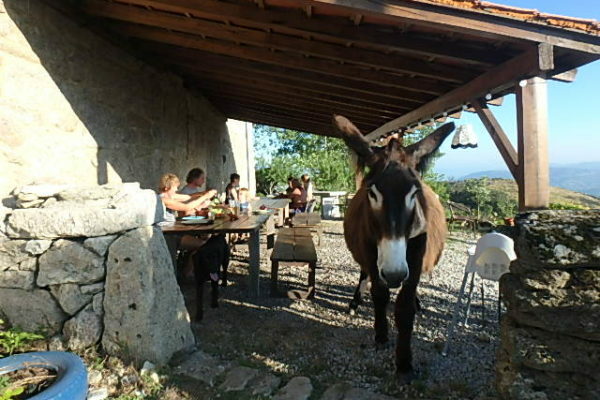 Although we are not a producing farm, you will still find some ´farming´ elements at our place. There is a good chance, when waking up and stepping out of your tent, you will see eye to eye with own of our ´farm pets´. Be it horse, donkey, dog, cat or the lots of them. Whenever possible, we allow for guests to interact with the animals our help us with our daily chores. Bit by bit (no tractores, only hand tools and an occasional big digging machine), we are trying to ´give back´ to the land by seeding, planting and digging. Increasing fertility and structure of the soil, restoring hydrological balance or planting indigenous local trees. Hoping to, some day, being able to literally pick the fruits of our hard work. We dare to call ourselves a nature camping. Because of our location, surrounded by nature, extensive farming and mountains. Lots of space, lots of freedom, no neigbours. Far from the madding crowd. That, to us, is quality of life, and thus holiday. So we have chosen to remain natural and small scale, even though our 5 hectares of land allow for far more. This way, we can ensure the good atmosphere, the personal service, the unforgettable meet and greets, the great barbecues and all the space you need. No booming radios or late night parties here. Our guests all need their good night´s rest so they can fully explore the hidden natural gems of this region. Be it on foot, by 4×4 offroad vehicle, bike, horse. On land, in the air or in the water. 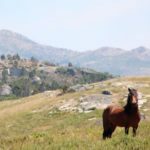 We have put quite some effort in bundling all our inside tips and tricks for you to fully enjoy your rural mountain holiday in Portugal. Eventhough it ´seems´ we are located in the midst of nowhere, we have enough suggestions for you to easily fill even a 3 or 4 week stay! For now, a quick list preview. Don´t forget: plan as little as possible, so you will have time to enjoy as much as you can. Please, please, please ; Before starting your journey to us, please make sure you either have a confirmed reservation or have contacted us to confirm availability. We wouldn´t want you to be driving all the way up here and waiting for us to come back from an excursion only to find out we have no availability. To plan your route, see google maps, Quinta Rural Farm Camp. We are located 8,5 kms outside (uphill) of the nearest village, Cabeceiras de Basto, also the nearest place for shopping and public transport. At only 97 kms (a bit over 1 hour) from Porto airport, 45 minutes from Braga and 35 from Guimaraes. Public transport will take you as far as Cabeceiras de Basto.